* The referee shall make all necessary rulings regarding the skills competition events. * Prior to the competition the team captains will determine which players are participating in which event and order of participation. 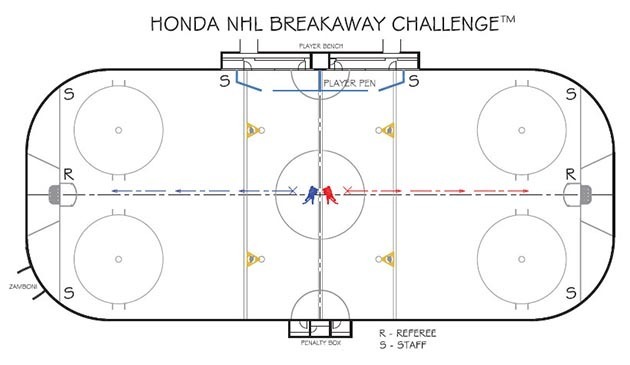 * For Breakaway Challenge, fans select 1 player to participate via Twitter during the week of January 19th. * Tie Situation -- Captains participate in a shootout if the competition ends in a tie. Captains chose their Goalie. * The contest consists of four races, (two players skating at one time). * One skater from each team is positioned side by side on the start line, both skaters race towards the same end zone, both turn outward, skate to the opposite end zone, turn back and skate past centre ice to the finish line. 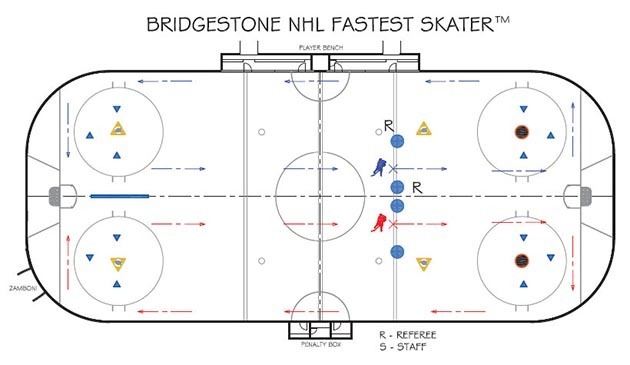 * The winner of each match is the skater with the fastest time as recorded by the timing devices. In case of a clock malfunction, the official time will be recorded by the referee’s stopwatch. * If a race ends in a tie, each of the teams will be awarded a point. If at the completion of the event the skaters who tied have the fastest overall time then the skaters will race again to determine which team receives the bonus point. 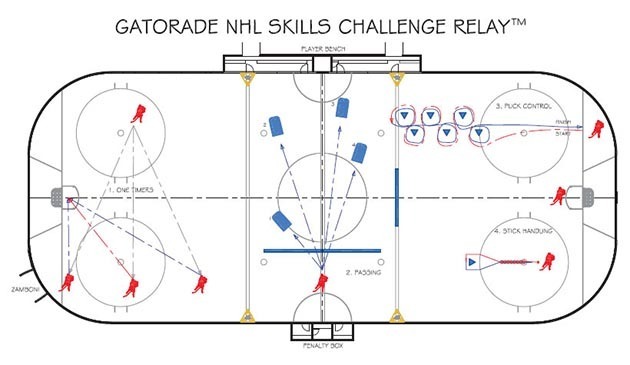 * Each skater will attempt three shots. * Players alternate after each skater attempts one shot. * The in-arena and television audiences will vote via Twitter for their choice of winner. * Four head-to-head matches featuring one shooter from each team. * Four destructible styrofoam targets 15 inches in diameter are attached to the goal posts, one target in each corner. 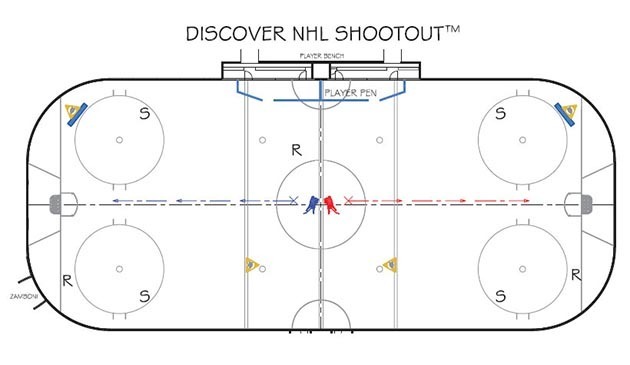 * Two players, one on each side of the net, alternately pass pucks to a shooter positioned 25 feet out from the goal line. * Shooters compete at opposite ends of the rink, alternating attempts. * The shooter who hits all four targets in the least amount of time wins the match. * Any contact of a target by a puck that is shot is scored as a hit. * If a match up ends in a tie, each of the teams will be awarded a point. If at the completion of the event the players who tied have the fastest overall time then the players will compete again to determine which team receives the bonus point. * This is a timed event, with the fastest time winning. * If both teams in the same heat have the same fastest time, each team will be awarded a point. If at the completion of the event the heat, which recorded a tie, is the fastest overall time then both teams will be awarded a bonus point. * Players alternate shots. Two attempts for each player. * A single puck is positioned on the ice 30 feet from the center of the goal. A player, starting no further than the nearest blue line, may skate towards the puck and shoot it from its positioned spot into the goal. The highest recorded shot (in mph) of two attempts will be scored. 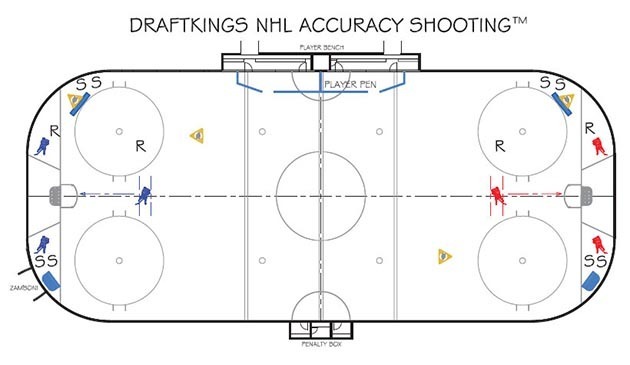 * Shots must be on goal to be calculated and all shots are recorded by radar in miles per hour. * If a puck enters the goal uncalculated due to a malfunction of the radar equipment, the shooter will be allowed an additional attempt. * If player breaks his stick he will be given another attempt. * If a match up ends in a tie, each of the teams will be awarded a point. If at the completion of the event the players who tied have the fastest overall speed then the players will compete again to determine which team receives the bonus point. * 21 Skaters and three goalies from each team. * Each round begins on the referees whistle and the first player to shoot is from the team that is trailing in overall competition points. If the score is tied the home team shoots first. 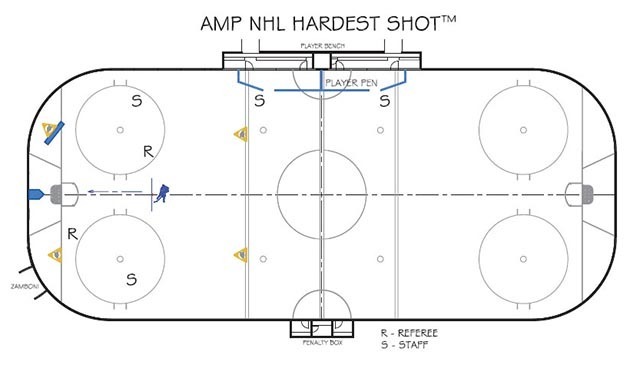 * Each scoring attempt is officiated in accordance with NHL shootout rules.